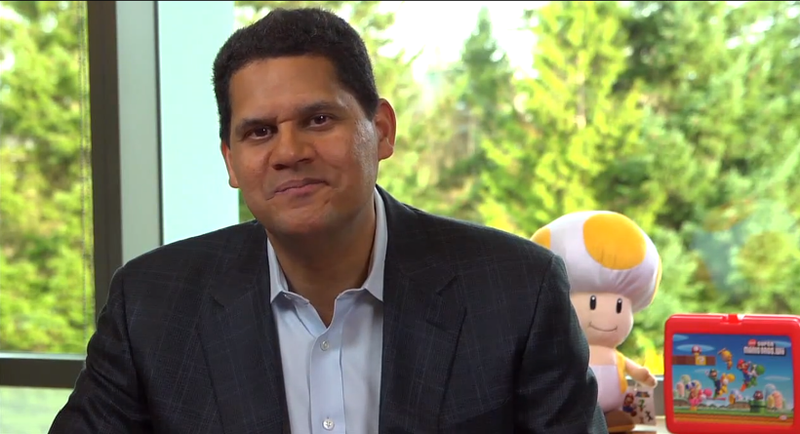 Yet another interview with Nintendo of America president Reggie Fils-Aime was posted today. This time, Waypoint published its own conversation with the executive. While the two sides were speaking, Reggie touched on Switch’s lineup and somewhat teased future announcements, Animal Crossing for mobile, why indies weren’t showcased at E3, shutting down AM2R, and more. We’ve shared some of the comments from Reggie below. Waypoint has the full interview here. Reggie Fils-Aimé: The response to what we’ve showcased, and it really is just a small tip for 2018, has been exceptionally positive. You’ve got fans seeing Metroid Prime 4, hearing that Mr. Tanabe, who’s been involved in all of the Metroid Prime games, is going to be at the helm of that, the fans are tremendously excited. To hear that there’s going to be a core Pokémon RPG experience on the Nintendo Switch, the fans are incredibly excited. To see a traditional Kirby experience, with him inhaling enemies and copying abilities, fans are excited about that. And then the Yoshi game that we showcased, with that unique, you know, motion to go “behind-the-scenes,” so to speak, has people really intrigued. So just by showcasing those four games, and giving a little bit of a taste, yeah there’s a lot of excitement to what 2018 can hold. But to be clear, we look at E3 in the here and now. Our focus is on games that are largely going to be available between now and the end of the holiday season. And when you look at that lineup, there’s a strong game coming literally every month, starting tomorrow with Arms, and then Splatoon 2, then in August is the Mario + Rabbids game, September, October with Super Mario Odyssey. We’ve got that great pace of content, and I can tell you there’s more to be announced. So, again, to unpack this, for March we had publicly committed that we would sell-in 2 million units. Where actually, we sold-through, so not even sell-in, sold-through 2.7 million units. So, clearly that’s a signal that we are aggressively producing the hardware. You look at what we’ve now committed for the next twelve month time frame, 10 million units, what’s interesting is if you look at that roughly 54 week time frame, that includes just one holiday season, that means that we will have sold into retail roughly, roughly 13 million units. That’s about the same as what we did for the Wii, to put it in perspective. So, we’re talking large significant numbers that we are producing, that we are flowing into retail. So it’s not a situation where we’ve somehow under called the production or had some issue. It really is a situation where the demand is extremely strong and we’re working hard to catch up. You know, the conversations we have with external partners really is more about, “How do you bring your current best and brightest content to the platform?” Because again, that’s a different situation. There weren’t many third-party exclusive games for the Wii U, and more what we want is certainly yes, a Mario + Rabbids type of experience that’s new and fresh, but also what we want are the best current games, like a FIFA 18, to come on the platform. So, specifically now, Animal Crossing. Animal Crossing development continues quite strongly, the teams are very excited about what they have. It’s an application that is going to launch this year, as we’ve committed. And we’ll be sharing more information in due course. We believe, just as we’ve seen with Pokémon Go, just as we’ve seen with Super Mario Run, Fire Emblem Heroes, we believe that the application will help broaden the user base for Animal Crossing, and it’s going to end up having a positive impact on our dedicated video game business of Animal Crossing. Well, I actually disagree with the comment. And here’s why, and again, it’s all about the setting, and where we do these activities. For the last three years, we’ve done major activity prior to PAX, showcasing indie content, big events. And so, we very much are, not just welcoming to the independent developer community, but we’ve made it a priority to showcase that content. And I’ll give you a very specific example, I met with the team from Nicalis, outside these doors, and they were talking about how excited they are about the sell-through that they’re having on our platform, and how excited they are on the content that’s coming on Nintendo Switch. And so, from our perspective, if the issue or the concern is “Boy, why weren’t we part of the Spotlight?” OK, I hear the point. But, boy, please don’t generalize that we’re not supporting the independent developer and the Nindie developer, because we’re supporting them at a very strong level. And again, you know, I think it comes down to the specifics. This is not an independent developer game, but let’s take our own Snipperclips. Digital-only content, that we featured strongly, and has an exceptionally strong attach rate to the hardware. And so, to me what it demonstrates is: we believe in digital-only content, our marketing approach is strong, whether it’s on device or off device, in terms of Nintendo.com and all the other ways that we support digital-only content. And for us, we want, again, the very best of that content available on our platform. And when it’s there, we think we do a great job driving it forward. Absolutely, and again, we have a history of this. Not exactly the same execution, but look at Shovel Knight. That’s something that our team saw very early. I think Yacht Club Games at that point was a three person studio versus a six person studio, but it’s something that we saw very early on. We were excited about it, we helped them—and, let’s be clear, they created a fantastic game—and what it was able to do with the Amiibo and moving into package as well, it’s been great. So, yes, we’ve got a dedicated team that helps, not only from a technical standpoint with independent developers, but help from all of the different ways that we can help guide a project to make it as good as it can be. So, I think there needs to be clarity in what the line is, and, in our view, the line is when an initiative crosses from being an homage to something that is monetizing our IP. We allow homages to exist in a variety of different ways. And, for me personally, as a fan before I was an executive, I understand the attraction that you could have to our IP. But, when it transitions to something that… now, you’re trying to monetize, you’re trying to sell, you’re trying to profit off of, that is what broaches or breaks through that line for us, where we have to claim our IP protection. But again, to differentiate this, we have had conversations with entities that started as fans and became more of a business partner. Those conversations happen all the time, but again, when something transitions to a commercial product, and that’s what [AM2R] was—there wasn’t a charge, but it was now a commercial product. Well, again, it’s all about… How do we protect our intellectual property? How do our creators, like Mr. Sakamoto, who created Metroid, and Nintendo control that intellectual property so that we can drive where it’s going, versus someone else driving where it’s going. That’s where the line is very clear for us. And again, we could go on to YouTube and a variety of different places and see fans doing interesting things with our IP. But when it turns to driving the direction of the IP, or somehow monetizing or becoming a commercial project, that’s where for us, the line has been crossed.